There are many things we use every day and don’t really think about where they came from and why they are the way they are. Zebra crossings are one of them. These special types of crossings typically give pedestrians permanent right of way when crossing the street. Chances are that you use a zebra crossing on your way to work each day, but have you ever wondered why they look the way they do? Why do they have stripes and why are they black and white, as opposed to any other colour or pattern? The zebra crossing was born on October 31st, 1951 as a solution to make crossing the road safer for everyone. Following the war, the amount of traffic on UK roads was increasing year on year. Although it was nothing like the amount of cars that we have today, the increase in traffic combined with pedestrians who were not used to cars meant that fatalities from accidents were particularly high. One of the main problems was that pedestrian crossings were marked by metal studs. These markings were easy to see if you were the one walking across the road, but not so easy to see from the driver’s perspective. This meant that they were usually not spotted by the motorist until it was too late to stop. It soon became obvious that a more visible style of pedestrian crossing was needed. During the late 1940’s, experiments with different road markings were conducted at a thousand locations around the UK. With all of the tests, there was one pattern that proved to be the most effective and that of course was the black and white stripes we are familiar with today. Not only were the stripes visible from far away, giving drivers enough time to reduce their speed, but the pedestrians walking across the street were also much clearer against the background. The origin of the zebra name is obvious, but who was the first person to make the comparison between the striped crossing and the exotic stripes of the African savannah inhabitant? The story goes that Jim Callaghan, who was a Member of Parliament in the late 1940’s and would later become Prime Minister, was the one to coin the moniker. He apparently visited the road crossing experiments and observed that they looked like the striped creature and the name stuck. What Other Animal Crossings Are There? Pelican Crossing – Featuring two poles with traffic lights and a flashing pedestrian icon letting you know when it is safe to cross. Puffin Crossing – An improvement on the pelican crossing with a sensor that detects pedestrians as they are waiting and crossing the road. Toucan Crossing – This crossing allows cyclists to also ride across. Two can cross (both pedestrians and cyclists), hence the name. Pegasus Crossing – Named after the mythical flying horse, this crossing allows horse riders to cross the street safely. The simple zebra crossing became an iconic part of pop culture thanks to the album cover of Abbey Road by The Beatles. This particular crossing is still there and it is a popular tourist site in London, with many tourists posing to recreate the famous photo (to the annoyance of locals just trying to drive down the street). 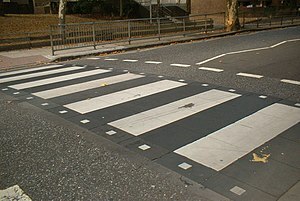 Now the next time you walk across the zebra crossing on your street, you might give a little thought to the origins of this pedestrian safety feature. Tags: crossing, history of, markings, pedestrian safety, roads, uk, zebra. Bookmark the permalink.